This research aims to examine the effectiveness of Human Relation and Environment Physical Condition to the improvement of Work Ethic and Performance. According to the revious research, environment physical condition recognized as an environment shaped by the implementation of human relation. Human relation contains mean a communication cause of haracteristic who are action oriented. Therefore, organization should give be a free for employee to communication, so they can be a good cooperative on their job. 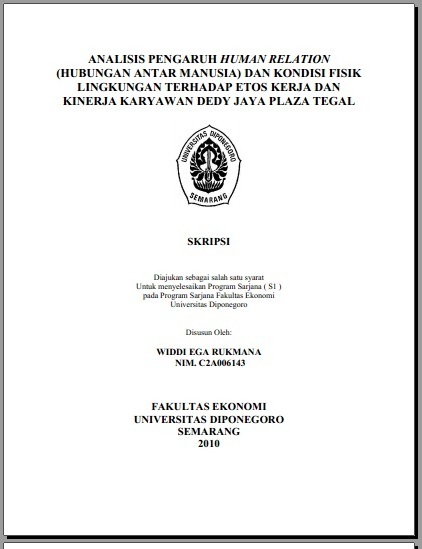 This study was held at one of trade corporation in Tegal. The method used is survey by distribute the questionnaires. From 68 persons of total population, by using the proportionate random sampling, 40 persons are selected as the respondent. The Path Analysis is used as quantitative analysis for this research. The Path Analysis done in two steps of linear regression. The total determination coefficient computation showing that 28% of the dependent variable change, can be explained by the independent variables. While the rest of 72% explained by another variables besides the research model. The partial hypothesis test in each path showing that work ethic has positive and significant effect to performance. Then, both of human relation and environment physical condition partially has no positive and significant effect to work ethic. menggunakan dua tahap regresi linear. variabel dependen mampu dijelaskan oleh variabel independen. Sedangkan sisanya sebesar 72% dijelaskan oleh variabel-variabel lain di luar model penelitian. 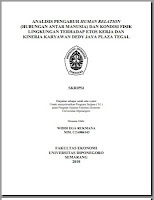 Hasil pengujian hipotesis secara parsial dari setiap jalur menunjukkan adanya pengaruh secara positif dan signifikan dari Etos Kerja terhadap Kinerja. Selanjutnya, Hubungan Antar Manusia dan Kondisi Fisik Lingkungan masing-masing tidak memiliki pengaruh secara positif dan signifikan terhadap Etos Kerja.